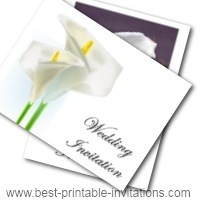 Are you looking for a Calla Lily Wedding Invitation for your special day? 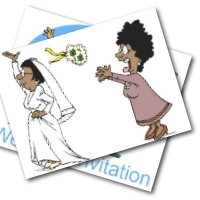 Here is a way to have a beautiful invite - and stay well within your budget. These gorgeous invites are free to print. But don't think you will be compromising on quality. Using a luxurious paper will give your invitations a professional look and feel. 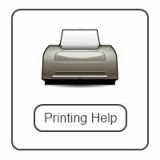 Why not try printing out a copy now? You may find they are exactly what you were looking for. 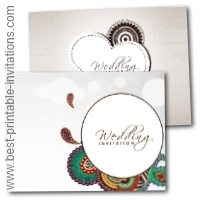 Use a smooth, slightly thicker paper to get an expensive look to this invitation. Calla lilies (or zantedeschia aethiopica!) 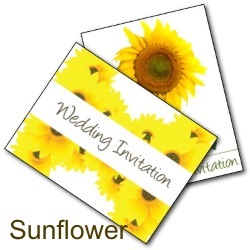 are a beautiful symbol to use on your wedding invitations - or as part of your wedding theme. Lilies themselves are linked to purity and abundance, whilst Calla lilies are often taken to mean beauty and innocence. 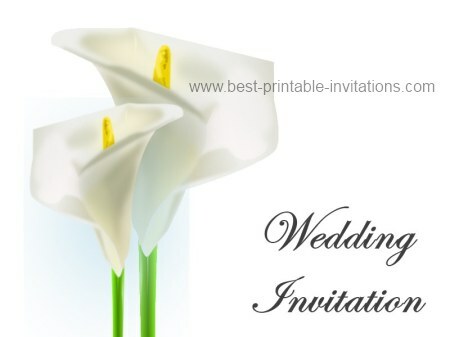 Although they come in different colors, I have used white versions of the flowers in the invites because white is the symbol of chastity and virtue. 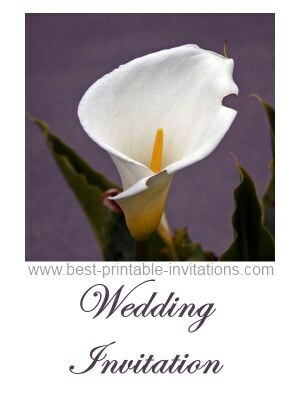 Calla lilies are the May birthday flower, so are extra special when used for a May wedding. As well as using the flowers in your invitations, why not tie them into the whole event? You can use them in your bouquet and other floral arrangements. They are a long lasting cut flower - often lasting for 7 to 10 days - so they will appear fresh and bright in your decorations. They look beautiful on their own and don't need any other foliage or flowers to be mixed with them. They seem to have a simple elegance that works very well for bouquets. There are some instructions for making your own bouquet here. They come in different sizes as well as different colors, so do your research before ordering with your florist.